Visual Arts teacher, Sonia Payan, is in a group show at New City Studio in Phoenix. 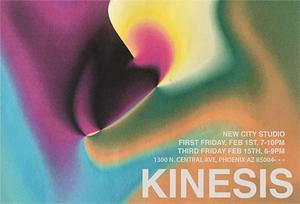 Come out this Friday, February 1st from 7-10pm for Kinesis, a show that explores the movements and transitions that we all experience in life, whether it be physically, metaphysically, or emotionally. From nostalgic photography to amazing performances by the Condor dance company, this is not a show that you want to miss out on!